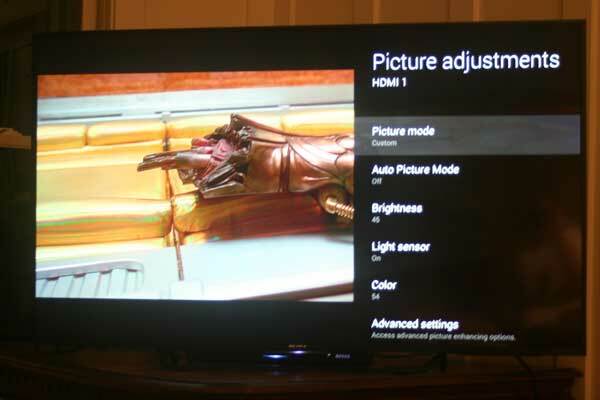 Following are the calibrated picture settings which we recommend for the X850C 4K LED TV. We do not post 10pt calibrated picture settings due to the fact that different TVs of even the same model and brand may calibrate differently especially when refining to a 10pt white balance calibration. Try the medium room light settings below and see how you like them. We've tried to incorporate some of the X850Cs best engineered features combined with a traditional calibration. We like to use some of the new picture technologies when possible (you're paying for them after all). At the bottom of the calibration are our notes on the included preset picture modes. Brightness setting is actually the backlight control so tune this up or down depending on room light. If you dont have any time to make adjustments, try the Cinema Pro setting for night­time viewing and the Cinema Home setting for day time viewing. Otherwise, use our Custom picture settings. Standard - Also overhyped unatural color, contrast preset to 100, too much blue in neutral color temp preset. Custom – This preferred mode gets you close to D65 and what we typically recommend for settings. Sofware related features under Clarity sub settings like: Reality Creation, Random noise reduction, and Digital noise reduction are all off under factory set. Under Motion the Film Mode (Cinemotion) is set to off. Cinema Pro – This is a very nice setting for a low light or dark room – especially for movies. Cinema Home ­- The increase in on­screen picture light is from the higher Gamma setting and moderately from the Live Color setting being in High. This is a good bright room and all purpose setting even for sports. Sports -­ We did not like this settings for sports nor anything else. It created lots of conflict and unwelcome additions on the screen, overhyped color, motion artifacts, and even some strobing efffects. The Film Mode is set to High so you get the soap opera effect unless you adjust it down. Animation – Did not test, but we can only assume animated movies look good on it. (For HDMI inputs there are also Photo­Vivid, Photo­Standard, Photo­Custom, Game, Graphics) Of course, the Game mode is the preferred setting for gaming to cut down on input lag. The X850C comes preset with the ClearAudio+ feature set to on. There are too many unwanted side effects from this sound setting including a hollow echoing effect. We recommend immediately turning this feature Off. This is all we needed to adjust to get a very good respectable sound quality from the TV. Voices were clearly separated from background noise and music. Both were nicely defined for a very good sound quality. Volume capability is adequate but not the best tested.